John McCain may no longer be with us, but if you looked at the headlines recently you may think otherwise. The feud between Trump and McCain lives on. Sparked by the news that McCain and his staff had a significant role in the infamous “Steele dossier” and its landing in the hands of the FBI, President Trump has made comments and tweets once again about his dislike of the late Senator. While it’s no surprise that there is no love between the two, President Trump’s comments continue to stir controversy, based mostly on the fact that John McCain was a “war hero”, and because of his service to this Country, he somehow should not be subject to such personal criticism. McCain was a Senator longer than he was in military service, are we not able to separate the war hero, from the politician? Can we not recognize that criticizing McCain during his political years is different than criticizing McCain who was a POW in Vietnam? Wouldn’t it be contrary to what makes someone a “war hero” if they are able to hide behind their years of service to insulate themselves from any criticism? The media, fellow politicians and even his family should think so, if not for the other motives behind their outrage. As a politician, McCain opened himself up to the same dynamics that any other public figure in the political realm does. His service is something one can admire, something that can be used to judge character, but is separate from the public figure that most of us knew. Criticism of McCain didn’t seem to be an issue all that long ago. The media regularly attacked McCain both politically and personally, especially when he ran for President in 2008 against Barack Obama. The media was far from kind to him, and his being a Republican made that media scrutiny even worse. Suddenly flash forward to the 2016 election, and we see a media that has done a complete 180. During the 2016 campaign and during those last years of McCain’s life, McCain suddenly became somewhat of a saint in the media. Was it his cancer diagnosis? Was the media wising up? Not at all. Like all things today when it comes to the media, it’s about Donald Trump. The old saying “the enemy, of my enemy, is my friend”, that’s what McCain became to the media. John McCain led the anti Trump movement on the Republican side, he was used by the media who once hated him, and worked to undermine Trump’s efforts any way he could, even going against what he had promised his own voters for years – the appeal of Obamacare. I previously wrote about McCain’s last days, which were sadly dominated by his hatred for Donald Trump. Instead of acting like the “war hero”, showing true valor and character at the end, in an attempt to heal and bring the Country together, McCain chose to do the exact opposite. Even in death he couldn’t let go of his hate for Trump, much of which I felt was based on Trump’s election to the Presidency, something McCain failed to ever accomplish, not any higher moral calling. Of course, in Donald Trump fashion, he sometimes goes too far, making comments that were deeply personal and even taking hits at McCain’s service in the military. McCain though failed to be the bigger person, and once Trump, a Republican, was elected President, he wouldn’t let it go. Even when Trump toned it down, and tried to extend an olive branch, McCain in his bitterness, kept it going. President Trump approved McCain’s funeral plans, and even after that was still barred from attending his funeral. Compare that to another war hero, the late President George H.W. Bush who wasn’t fond of Trump either, but knew there were bigger issues than his personal feelings at stake. President Trump was at President Bush’s funeral. 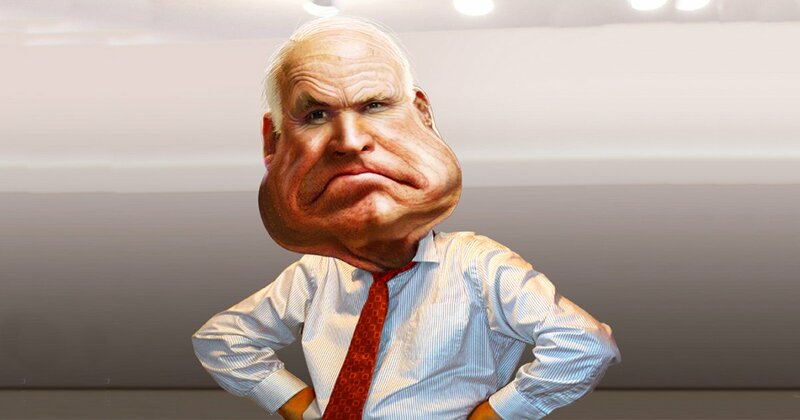 As we learn more about McCain’s role in the infamous “Steele dossier,” I can’t blame President Trump for being angry. McCain’s last votes on the Senate floor were made to oppose the President solely out of spite. He continued to undermine the White House and divide his own party and his country. Now we find out he had a role in disseminating the fake dossier slipping it to the FBI. McCain is accountable for all of these actions, many which weren’t very honorable. McCain may be gone, but his legacy and actions live on. That’s part of being a public figure. People will have their opinions and commentary, and have the right to them, whether he is here to defend himself or not. I once admired John McCain for both his service both in the military and as a politician. I even worked on his 2008 campaign. Unfortunately both his behavior during and after the 2008 election, and then in the era of Trump, has altered my opinion greatly. It became apparent that the once “maverick” had become victim to and part of the DC swamp. Still, that doesn’t mean I don’t still have respect for his military service to this Country. We all should remember that life is much more complicated, our historical and public figures are much more complex than a black and white, all or nothing viewpoint. The only reason the media and others are outraged by criticism of John McCain is not out of respect for the man, war hero or politician, it is to attack President Trump and silence anyone who speaks out. Those who speak out against McCain, are most likely Trump supporters, and are most likely speaking out against the media, the liberal agenda and the swamp too. Felicia Tweedy is a political activist and professional who has served elected officials and campaigns on both sides of the aisle, and an entertainment industry professional.